marched with Martin Luther King Jr. on the road to civil rights. Rev. King marched with the Jews on the road to a secure Israel. Martin Luther King whose life and dream we celebrate today was a great leader for civil rights. Unlike today’s “Civil Rights” leaders who seek divisiveness and handouts, Dr. King dream was a post racial society where people where judged by the content of their character instead of the color of their skin. The most famous line from the letter “When people criticize Zionists, they mean Jews. You are talking anti-Semitism,” was uttered by Dr King, just not in any letter. Over the next day or two you will read various posts containing the letter most of the text does not contain the words of the great Civil Rights Leader. The good news however, is it does contain his sentiments. We were initially doubtful of the authenticity of the “Letter to an anti-Zionist Friend” because the language in the first paragraph seemed almost a parody of language used in Dr. King’s “I have a dream” speech. Additionally, we could find no reference to the “letter” prior to 1999, which was odd because the text is such a dramatic denunciation of anti-Zionism — one that would have been cited widely. However, we then found the “letter” in a reputable 1999 book (“Shared Dreams,” by Rabbi Marc Shneier) whose preface was written by Martin Luther King III. Since the King family is known to be extremely careful with Dr. King’s legacy, we assumed they must have verified the accuracy of the book before endorsing it. Additionally, we found that quotations from the “letter” were used on July 31, 2001, by the Anti-Defamation League’s Michael Salberg in testimony before the U.S. House of Representative’s International Relations Committee’s Subcommittee on International Operations and Human Rights. The same “source” (Saturday Review, August 1967) for the “letter” that was mentioned in the Schneier book was also cited in the testimony. Since many in the Anti-Defamation League had actually worked with Martin Luther King, Jr in the civil rights struggle, we assumed again they would be very knowledgeable about King’s work and would have thoroughly checked anything they chose to read before Congress. THE REV. MARTIN Luther King Jr. understood the meaning of discrimination and oppression. He sought ways to achieve liberation and peace, and he thus understood that a special relationship exists between African Americans and American Jews. This message was true in his time and is true today. He knew that both peoples were uprooted involuntarily from their homelands. He knew that both peoples were shaped by the tragic experience of slavery. 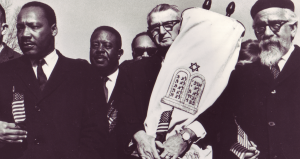 He knew that both peoples were forced to live in ghettoes, victims of segregation.He knew that both peoples were subject to laws passed with the particular intent of oppressing them simply because they were Jewish or black. He knew that both peoples have been subjected to oppression and genocide on a level unprecedented in history. During the recent U.N. Conference on Racism held in Durban, South Africa, we were all shocked by the attacks on Jews, Israel and Zionism. The United States of America stood up against these vicious attacks. King taught us many lessons. As turbulence continues to grip the Middle East, his words should continue to serve as our guide. I am convinced that were he alive today he would speak clearly calling for an end to the violence between Israelis and Arabs. He would call upon his fellow Nobel Peace Prize winner, Yasser Arafat, to fulfill the dream of peace and do all that is within his power to stop the violence. He would urge continuing negotiations to reduce tensions and bring about the first steps toward genuine peace. King had a dream of an “oasis of brotherhood and democracy” in the Middle East. The Reverend Dr. Martin Luther King was a great man who believed that everyone should be able to live in peace and freedom, no matter how they worshiped God, or the pigment of their skin. He was an early supporter of Israel, who knew how to cut through the phony anti-Zionist memes of many anti-Semites. Many Civil Rights leaders, heck many political leaders today would serve themselves well to better understand the words of this man of peace.